Home & Office Rubbish Removal Merton SW | Quality Property Care Ltd. Residential and commercial junk removal is the most optimal solution for loft clearance, office clearance, house clearance, builders waste removal and waste disposal, garden waste removal and all clearance cases with big junk amount available. To find more info, contact us, please on 020 3746 4287. You can speak to our polite customer support reps! Quality Property Care Ltd. is a professional junk removal company in Merton SW with the right formula for disposal wasting in your home or office. The skilled techs are trained to manage each individual case with an individual approach. Once they take a look at your junk, they will make you an offer for a rubbish removal service date arrangement, final price calculated on the rubbish size, moving route and required duration for packing. Attention: you don`t have to supply any cardboard, bags or other packing supplies. In addition to these, our junk removal company in Merton SW can also deliver you a good combination between household rubbish removal and cleaning service at a promotional final rate with a discount. Pay less, use more ! For properties we can accommodate any size of rubbish removal, from a few boxes and packages to a big load of trash. All of the materials we remove of will be driven to the closest location for recycle, with all of the fees and charges covering not only our labour but also any fees that apply to the proper disposal of the waste and materials. 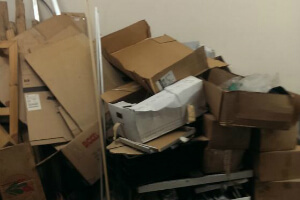 It is prefered that your rubbish and junk are all package up, however, we can deal with that as well. We can eliminate single mattresses, tables, dryers, TVs, kitchen units,, 3 seater sofas, armchairs, double mattresses, 2 seater sofas, , king sized bed, microwaves, divan beds, ovens, washing machines, cupboards, PC monitors, mirrors, wardrobes, books shelves, bathtubs, carpets freezers, TV stands, single beds and much more. Items like fridges and fridge doors, tires, TV’s, air conditioners, microwaves and such need more fees for proper disposal. We can remove both industrial and household construction materials from sights, starting with timber, wood, metals, plastic, glass, rubble, soil, cement, concrete, tiles, plasterboards, bricks, and ceramics. Here we charge by weight for construction materials with the most typical materials being cement, rubble, timber, and soil. We work inside the bedroom, living room, children’s room, kitchen, garden and hallway. We can securely remove and dispose of wardrobes, beds, bedside tables, dressing tables, ,mattresses, chests or drawers,, armchairs and sofas, side and coffee tables, living room storage TV stands and cabinets, console tables, shelving units, cot beds, , bunk beds, playgrounds, bunk beds,wardrobes, desk and chairs. In the kitchen we remove dining tables, dining chairs, stools and benches, barbecues, umbrellas, shoe cabinets, racks and stands, hoods and hangers, wall shelves, baskets, portmanteaus. There are household items like fridges, freezers and etc. that require special disposal and have extra fees included to them. While on the phone be sure to mention that type of couches we are taking out as this will help us figure out how many men and what equipment to take. We prefer that you bag the items before we come, however, it is not necessary as our team can do that as well. Starting with single mattresses, ovens, tables, washing machines, cupboards, PC monitors, double mattress, divan beds, dryers, TVs, Kitchen units, single beds, fridges, armchairs, kitchen units,, mirrors, 2 seated sofa, double bed, freezer, book shelves, carpets, 3 seat sofas, king sized bed, microwave, wardrobes and bathtubs. These are just to name a few. Items like tires, macrowabes and TVs are charged extra as they require a special disposal technique to guarantee their safe removal and recycling. Call Quality Property Care Ltd. Junk Removal and Get Good Prices! If professional junk removal service in Merton SW is a must for you, you are basically on the perfect spot. Call this phone number: 020 3746 4287 and reach our kind customer support representatives. Arrange rubbish removal service at this moment! Bring back the order around you and get rid of the last sign of the chaos ASAP!